Understanding the fundamentals of how gears work, and what effect varying the size of the front chainrings and rear cassette sprockets will have on your pedalling will help you choose the most suitable gearing for your ability. It’s hard to know whether you need a classic, compact, or a mid-compact chainset, and then you might want a 10 speed, 11 speed or even now a 12 speed groupset to go with it. In the following article we’ll help you become more gear savvy efficient cyclists — we promise. What determines the number of bike gears you have? It’s a simple multiplication of the number of sprockets at the rear with the number of chainrings at the front. 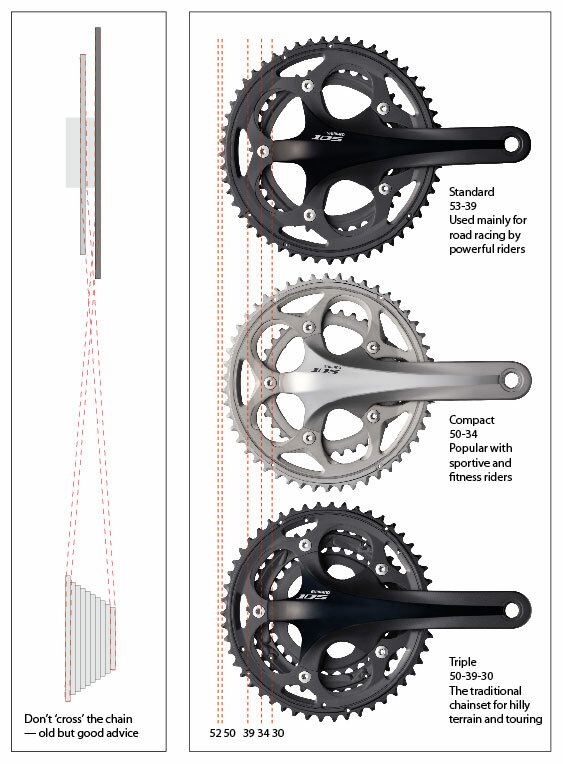 A triple chainring set-up with a 10-speed rear cassette is therefore a 30-speed bicycle — in other words, it’s possible to use all of the 10 sprockets in combination with each of the three chainrings. Likewise a double chainring paired with an 11-speed cassette is a 22-speed set-up, and so on. Why do you need gears on a road bike? Why have gears at all? Well, in a nutshell, gears are there to enable us to maintain a comfortable pedalling speed (or cadence) regardless of the gradient or terrain — something that no one single gear is capable of. A high gear, sometimes referred to by cyclists as a ‘big gear’, is optimal when descending or riding at high speeds. The highest, or biggest gear on a bicycle is achieved by combining the largest front chainring size with the smallest rear cog or sprocket — expressed as ‘53×11’, for example. Vice versa, combining the smallest front chainring size with the largest rear sprocket size results in the lowest available gear, which will help you keep the pedals spinning when the road points steeply up. Let’s be clear about one thing — having lots of gears is not about making the bike faster. A bike with 30 or more gears is not an indication of a machine designed to break the land speed record any more than a bike with only a single gear, assuming similar ratios. It’s about efficiency and having a much broader range, or choice, of gears for a given situation. Just like a car, bicycles benefit from a low gear to accelerate from a standstill, or to climb a steep hill, and at the other end of the scale a high gear helps you to achieve high speeds without over-revving. Continuing with the car example, using too low a gear at high speed would result in high fuel consumption. The same is true of your body pedalling a bike. So, quite simply, more gears means more scope to find your preferred pedalling speed. To put this into perspective, in the days of five or six-speed cassettes, a range of 12-25 teeth could only be achieved by having sizeable gaps between sprocket sizes. Modern 10 or even 11 speed cassettes with the same spread, 12-25, would have only single tooth increments for the majority of the shifting. Why do some people opt for a single speed bike? You don’t have to ride bike with gears – some people choose to ride singlespeed bikes. These still have a gear – which is determined by the size of the front chainring and rear cog. Singlespeed bikes are popular among commuters living in flat areas, because they require little maintenance. They’re also used by some racers who want to drop weight and cut down on any extra complication coming from the shifting process – in this case, choosing the correct gear ratio is crucial. Finally, track bikes only ever have one gear – though again riders will change their set up to suit certain events. The result is smoother, more precise shifting, as the mechanical difficulties the chain has to overcome to climb onto the bigger sprocket or drop down onto a smaller one are much reduced with smaller increments, but most importantly, the possibility is there to greatly improve pedalling efficiency. Cyclists are much more able to fine-tune their pedalling speed to suit the gradient or terrain, often resulting in a lower energy cost. The reality, on a multi-geared set-up, particularly when there are as many as 33 on offer, is that ‘overlapping’ gears are unavoidable. In other words, some gear combinations will result in the same ratio as others using a different sprocket and chainring. For example, 53×19 is the same gear as 39×14. Also, certain ‘crossover’ gears, at the extremes of the range, may not be recommended for use, due to the additional strain that is placed upon the chain. Old-fashioned advice, which is still relevant, is to avoid ‘crossing the chain’. See the diagram on p90 for an illustration of this. So you’re not always getting 33 gears at your disposal, but it’s not some kind of marketing trick by manufacturers, to slyly cheat you out of gears, it’s simply the nature of the beast. As we’ve already said, the total number is not the selling point, instead it’s the ability to have such a continual progression of closely spaced gears. There’s no need to struggle these days because there are heaps of gearing options available so riders of all abilities can get the most from their pedalling. The trick is to know what’s what, so you’ll be able to decide what will best suit your riding. Here’s the lowdown to put you on the right track. Two chainrings at the front paired with up to 11 sprockets at the rear. Common gear ratios are 39t or 42t for the inner ring and 52t or 53t for the outer. A standard double set-up is usually the preferred choice for racing, offering the largest chainring sizes for the biggest gears possible to keep you pedalling smoothly when speeds are high. Some reduction of the lower gearing is possible, but only as low as a 38t inner chainring, so if it’s low gears you’re after, a standard double is not the best way to go. Having three chainrings brings the possibility of adding a much smaller gear option. The third chainring is usually 30t or smaller, which when paired with a large ratio rear cassette, can provide an extremely low gear for use on steep climbs. A triple is the preferred choice for riders looking for a ‘bail-out’ option, often those regularly riding in very hilly regions. It’s also beneficial for laden touring when baggage makes the battle against gravity even tougher. A compact is essentially a double set-up, only smaller. Both chainrings are reduced in size, usually 34t or 36t inner, paired with a 48t or 50t outer, reducing the gear ratio across the range. It’s currently a highly popular choice as the reduction in gearing at the lower end is enough for most to tackle even Alpine climbs, yet there is not a huge reduction of the top gear, still allowing fast descending. Apex was the first of a new wave of ‘super-compact’ gearing. SRAM has based Apex gearing around a compact double chainset, but utilises a specially designed rear derailleur and large ratio cassette of up to 11-36t to significantly reduce the gearing. This not only offers an extra low bottom gear, lower even than a triple, but also provides an equivalent or larger top gear than a triple too. In this way, the Apex set-up aims to practically negate the need for a triple — a broader range of gears, that’s lighter and better looking. 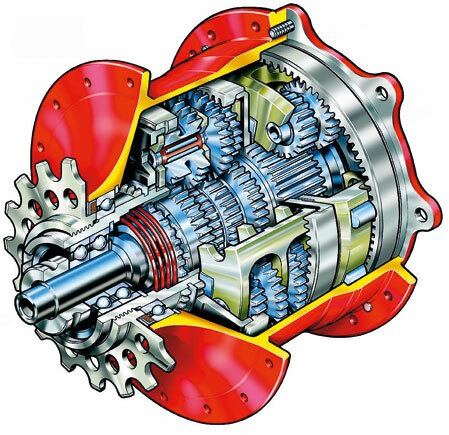 This type of robust, low-maintenance planetary gear system, housed in a fat rear hub, is still going strong. The popular Rohloff hub has 14 gears, while four, seven, eight, nine and 12-speed options are available from the likes of SRAM, Shimano and Sturmey-Archer. The choice of individual gears may be less than using a derailleur system, but it’s still possible to personalise ratios by playing around with chainring and rear sprocket sizes. Hub gears are generally tough and require very little maintenance so they’re great for everyday commuter bikes, especially as most allow you to change gear without pedalling too — handy at traffic lights. Their weight is their Achilles heel, counting against them in hillier terrain and on longer rides. As a simple fix to reduce a compact gear ratio a tad further. PMP’s 33t ring simply replaces the standard issue 34t, and Bob’s your uncle… the bottom gear just got lower. What does 11-23 or 12-25 refer to? The first number is the smallest sprocket size, often 11t or 12t and the second number is the largest sprocket size, commonly anything from 21t to 28t and sometimes larger. How to road bike gear shifters work? With some modern designs, it’s not always immediately obvious where the shift levers are. If you’re in any doubt, a local bike shop will run through this with you, but here’s the basics for the majority of what’s on the market. Regardless of brand, right-hand levers control the rear derailleur, and left hand levers the front. Chainring: toothed ring at the front end of the drivetrain, attached to the crank. Cassette: cluster of sprockets at the rear of the drivetrain, containing up to 11 gears, of various sizes. Block: another term for the group of rear sprockets, but really refers to the older, screw-on freewheel. Derailleurs: front and rear derailleurs do all the hard work of moving the chain from one sprocket (or chainring) to the next. Sprocket: refers to an individual gear within the cassette/block. Ratio: describes the relationship between sprockets and chainrings, for example ‘53×12’, or the sprockets on a cassette (11-25). t: short for teeth — to describe how many a given sprocket has — for example ‘23t’. Drivetrain: term grouping together all the moving parts that connect the crank to the rear wheel and hence drive a bicycle along — namely the chain, the cassette and the chainrings. Cadence: pedalling speed, measured from how many revolutions the crank makes per minute — expressed in RPM. STI lever: abbreviation of ‘Shimano Total Integration’ — a term for Shimano’s design combining brake and shift levers for road bikes, but often (mis)used generically to refer to the shift/brake levers regardless of brand. 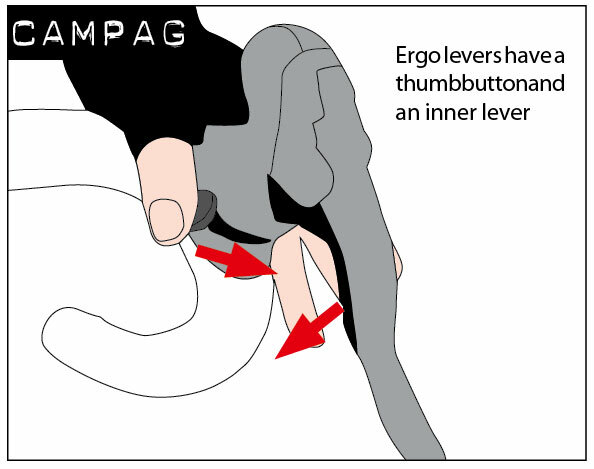 Ergo lever: Campagnolo’s name for its version of integrated gear shift and brake levers (ie Campagnolo’s STI). 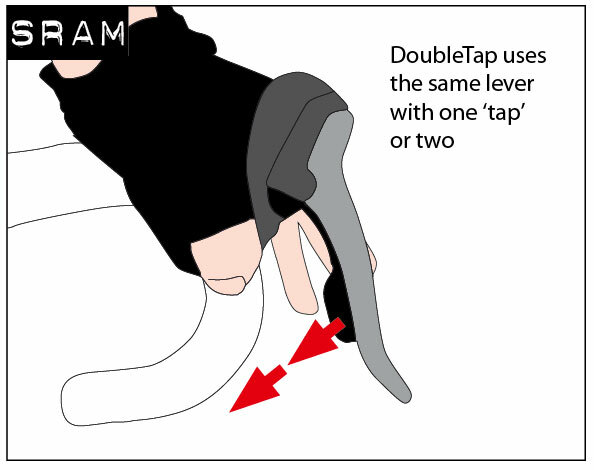 DoubleTap lever: SRAM’s slice of the pie, in terms of shifter technology — uses the same lever for upshifts and downshifts.